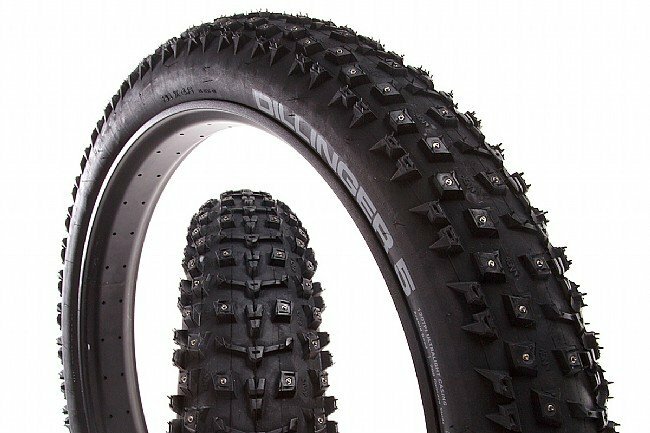 Blast through winter conditions with the 45Nrth Dillinger 5 Studded Fat Bike Tire. Widely spaced lugs help shed snow across the ultra-wide contact patch, and for icy conditions, concave-tipped aluminum-carbide studs bite into frozen terrain with a sharp attack angle that further sharpens with use for winter performance that lasts. 26" x 4.6” (258 studs). Folding aramid bead. 120 TPI casing. Compatible with rims 65 - 102 mm wide. These tires are amazing...with the warm up and quick freeze here in Michigan, you get very slippery conditions in the woods. These tires are so much fun, no matter the condition, you keep on rolling! I was tired of fighting the constant changing snowice conditions that I almost sold my fat bike after two winters. I decided to try one more winter and buy studded tires. Im so glad I stuck with it!!! These are the only studs I have tried but wow they are amazing. I can ride now in any conditions. They roll amazingly well and the weight is not bad at all. Best studded tires I have ever used. Have been riding a lot on the lake this winter. These tires have performed better then I ever thought. Also work very well on trails, have never had any issue with traction. Hook up well when climbing. Low rolling resistance as well. Would highly recommend to anybody. biggest studded tire out there..
Biggest studded tire out there. Only criticism is the price. For about half the money you could get the Vee Snow Avalanche, which is also studded and similar in size (up to 4.8 I believe). Good rolling resistance for icy conditions that don't demand a lot of float. Well made light weight Fat bike tire. Great all around tread pattern with studs for ice. Perfect beadrim edge engagement. Smooth rolling, relatively quiet, great tractioncornering. Better grip on ice, rolls great. I am new to fatbiking and I quickly learned that studs are necessary to ride during the winter in my area. Before having studs, I fell constantly. My tires would lose grip and slide like crazy on all the patches of ice. Getting the Dillinger 5s was a big improvement. The bike was able to stay upright better on the patches of ice and there was not any noticible difference in speed or performance. HOWEVER, I have still managed to make these tires slide out when I ride quickly into corners or other aggressive maneuvers. I have just learned that I cannot ride as aggressively as I typically do in the summer on my full-suspension mountain bike. I would still recommend the Dillinger 5s as they seem to be some of the best snowice tires available. But do not expect to gain unlimited grip. Okay, so they are fat, nearly 5 and they have 258 studs. I could climb trees with a low enough gear! I commute daily in Anchorage, where conditions vary between deep powder, hard pack, and freezing rain. These tires stick to the ice and squish out wide enough to keep traction in the deep stuff. Theyre heavy, and roll slower than the D4, and production quality seems lower than previous 45Nrth tires Ive purchased. The studs werent fully seated so I chose to use an insertion tool to seat the worst and then ride on dry pavement to seat the rest. Thats not been necessary on the D4s I bought for my bike or my wifes.